This is the original post from my family blog that I wrote back in July 2011 from Mason's Arrival. Enjoy the story! 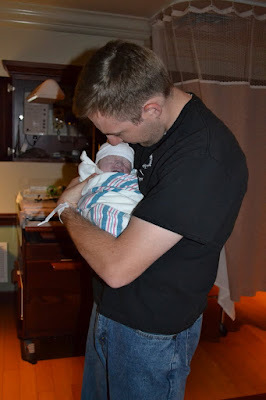 Monday, July 18th 7:30am, Matt and I arrived at the hospital for our scheduled induction. I was induced with half a pill of cytotec and then we waited, and waited. I was 2-3 cm dilated when we arrived at the hospital. Doc didn't come back until 1 to check me. I was having just very small contractions up until then. Doc came in and I was unchanged and did the other half of the pill. I started to feel more contractions but really they were just like the braxton hicks I had been having for the last month just more regular every 1-2 minutes. Doc said at the check up at 1 that I would be picking up and that Mace would be here around 4:30. We called our doula to come in anticipating active labor to start. She arrived and we just talked and watched me really do nothing. She left around 3:30 to give us alone time and asked us to call after the doc did his check again. The doc arrived at 5 and one look at me told us either he brakes my water or I go home cause he could tell I wasn't much further along. I didn't want to home so we let him break my water. I was 4cm dilated at this point. Within 30 min of my water breaking I started to feel what real labor felt like and was wishing for the barely there contraction I had earlier. I made Matt call the doula to come back in cause I didn't know what to do to get comfy. I asked Matt about 10 times if he really contacted her and he assured me he had. I was starting to panic because it hit me that this kid was going to be here soon. 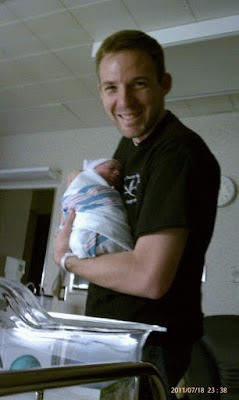 When my doula arrived she jumped right into action. At this point I can't really remember what happened. Matt and my doula have been filling in the blanks for me and telling me what happened. I labored in the bathroom for a while and the nurse had started the bath tub and I immediately wanted to go in there because I was hoping for a little relief. I got into the tub and for about 2 min had a little relief and then, bam, contractions happening again. My doula started timing the contractions and gave up because I was in hard labor but not having the regular contractions of hard labor. My contractions were for only about 30 sec and 1.5 min apart and STRONG! I hated the nurse because she would make me go into an awful position in the tub so that she could take the heart beat of Mason. She would take the doppler and push it into my stomach during a contraction. Every time she came in the bathroom I said, "He's fine, you don't need to check. Don't push." Every time she would check he was fine, as I said. In the tub I started to feel like I had to push and by the third time I told my doula I think I had to push she ran out and got the nurse who checked me and told me to get out of the tub and go to the bed. As I made it to the bed I had another strong contraction and finally made it to the bed. When I got there the nurse said she called the doc and he was on his way. After what felt like forever the doc arrived and I never felt happier. He checked me and I could tell that there was a little pushing happening. He said that my cervix was pretty much gone but a little bit and said, "let's just go ahead and try pushing." I did one push and he said, "Oh, yeah this baby's coming out." He also said that Mason was sunny side up and that I had to push in the WORST position possible, flat on my back and use handles to pull myself up. I pushed for about 50 min. Matt was amazing during the whole day, but the look on his face when he told me that Mason had a TON OF HAIR, he was so proud. 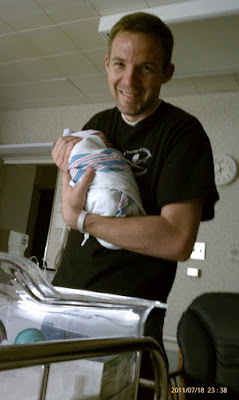 Matt couldn't believe what I was doing and what was happening and was so very impressed with how birthing is. I remember looking at him for strength to keep pushing and just looking at how happy he was was amazing. At the very end Mason did a 180 degree turn in the birth canal and was delivered in the normal position for babies to be born in which makes it a little easier. Right as Mason came out, I remember seeing the nurse and the doc jump backwards as the remaining bag of water attempted to soak them. I remember laughing slightly and thinking, "payback for you hurting me and the doc telling me to push harder when I was already pushing as hard as I could!" I still don't remember a lot of details and some things come back as Matt or my doula tell me but it just kind of feels like a cloudy dream thinking about it. One detail I didn't forget to mention is that, I didn't have an epidural. I didn't even have time to think about it because from 5pm-8pm I went from 4cm - 10 cm. Once my water broke I was in hard labor and stayed there for the entire time. The doc let me do mother directed pushing where I call the shots for how long I push for and everything which was really nice. No one was screaming at me counting. It was just a great, but very difficult experience. My biggest frustration is that I couldn't figure out why I couldn't get comfy to help relieve the pain. The pain was more of just really, really bad cramps, but I just couldn't get comfy to help me thru it. 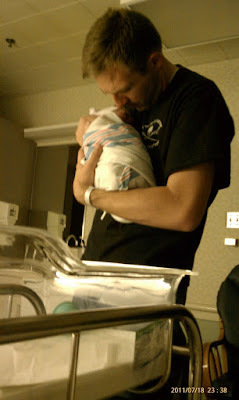 I am so happy that I accomplished the type of labor I wanted and that I survived. I am so happy to have my little mini-Matt here with me. It is truly amazing what the female body can accomplish from making another human to delivering a human without too much harm to either party. I am so thankful that I have been blessed to have a baby. For so many years I thought that it would never happen. I am just so thankful. 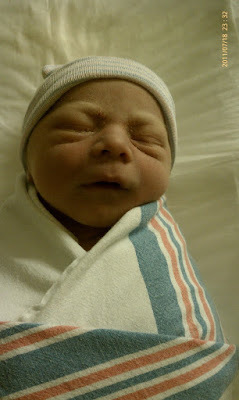 Check out some pix just after the birth!